Kris Bryant hit his first home run of 2018, a solo blast, in the third inning. 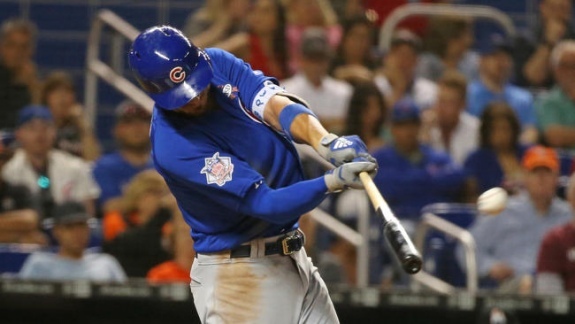 That was the only run the Chicago Cubs could push across the plate against the Miami Marlins on Friday night. Being only two days into the 2018 Major League Baseball campaign, the Chicago Cubs and Miami Marlins played the longest game of the season last night in front of 12,034 fans. The Marlins' Miguel Rojas singled off of Brandon Morrow in the bottom of the 17th inning and drove home Brian Anderson to defeat the Cubs, 2-1, at Marlins Park. Odrisamer Despaigne earned his first win of the season. The Cubs have split the first two games of a four-game series against the Marlins, and in the process have seen 10 pitchers toe the rubber. Of those hurlers, all but one has already logged one full inning pitched. Morrow, the Cubs' new closer, only threw two pitches before surrendering the game-winning knock. Eddie Butler, tagged with last night's tough-luck loss, pitched seven four-hit innings in relief. Commissioner Rob Manfred has recently decided to poke the dragon and consider starting games that stretch into extra innings with an automatic runner on second. Will that speed up games? Possibly. Will that lead to more scoring and even longer games? Possibly. Will it aggravate baseball purists? Absolutely. But often do MLB games need extra innings? Six of the 24 games played on Thursday and Friday were tied after regulation (two were postponed due to inclement weather). The Baltimore Orioles and Oakland Athletics needed 11 innings to defeat the Minnesota Twins and Los Angeles Angels respectively. The Milwaukee Brewers needed 12 innings to spoil the San Diego Padres' home opener. In addition to the Cubs-Marlins 17-inning affair, two other games needed extra frames. The Philadelphia Phillies beat the Atlanta Braves, 5-4, in 11 innings. And in a slugfest with only one home run, the Pittsburgh Pirates beat the Detroit Tigers, 13-10, in 13 innings. Will the rash of extra-inning games continue? Are managers to blame for overthinking their bullpens and overextending their relievers? Are position players swinging cold bats after transitioning from warmer climes in spring training? Is this purely an anomaly? Fans will find out as teams pursue their respective pennants and October glory.